Here he is looking so proud with his new shade. It turned out better than I thought. 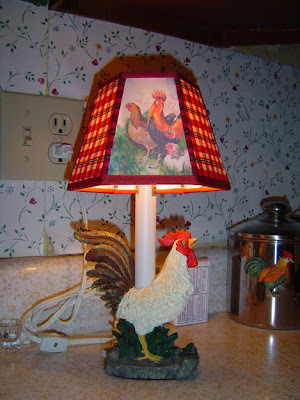 The rooster on the shade matches the wallpaper since I took a picture of it, but it still amazes me when I look at it. 1. Love them...I'm actually working on painted furniture...so hopefully we can meet up at a craft/home show sometime! Haha. 2. Actually, I have a cup of tea right now... And these are soo cute.